Based in Middlesbrough, Hillier Jewellers was established by John and Eileen Hillier in 1978, and has built a reputation as one of the most respected jewellers in the North East of England. 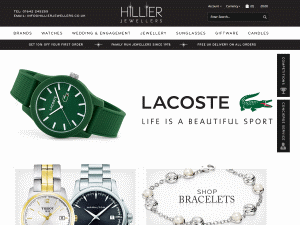 Four decades later, Hillier Jewellers remains a family-run business, trading from the heart of Middlesbrough town centre at 44 Linthorpe Road, and online at hillierjewellers.co.uk. Shop online for a large selection of watches, jewellery, china and sunglasses, including leading brands such as Seiko, Citizen, Mondanie, Tissot, Hugo Boss, Swatch, Ray-Ban, Oakley, 88 Rue Du Rhone, Hamilton, and many more. At Simply Beach it’s all about looking great in swimwear! Whatever your size or shape, they've styles to flatter, with cover-ups, dresses and accessories.